While competencies are not new to most organizations, the language used can often be confusing. When embarking on a competency-initiative, it is important to understand what is meant by the various terms, and how all the pieces fit together. Making sure everyone is speaking the same language will go a long way in increasing buy-in into the concept of using competencies, conveying the benefits of competency-based talent management, and more quickly ramping up adoption of the tools. 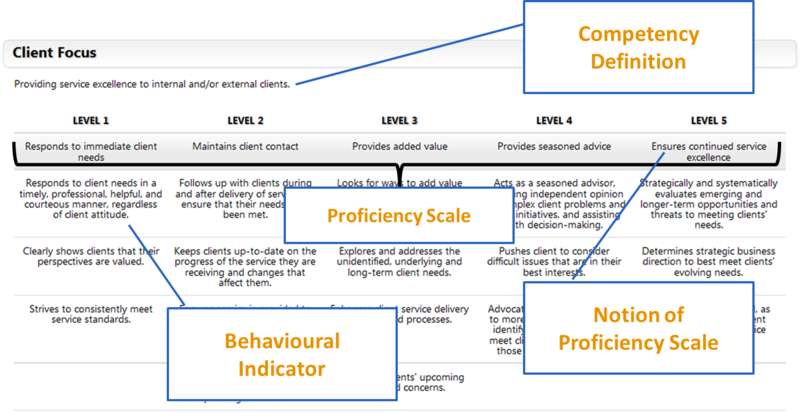 In this first post, we will define all the elements of a competency, making sure that you can easily describe its elements and how it is used within a competency profile. In the next post, we will define the competency architecture and its components. We define competencies as the observable abilities, skills, knowledge, motivations or traits defined in terms of the behaviors needed for successful job performance. Properly designed, competencies translate the strategic vision and goals for the organization into behaviors or actions employees must display for the organization to be successful. Competency-based Talent Management (CbTM) standardizes and integrates all HR activities based on competencies that support organizational goals. The definition describes the competency and the essence of the behaviours contained within. Proficiency Scales, or Levels, are used to define incremental degrees of proficiency for a given Competency. As you move up the proficiency scale from level 1 to level 5, the required behaviors become more complex, have more impact and are more strategic in nature. If we look at an example of a sales department, Level 1 behaviors would be required for entry-level positions, such as a telemarketer or account development representative, and the Level 5 behaviors would be expected from a Vice-President of Sales who communicates strategically to achieve specific objectives. The notion of a proficiency scale summarizes the overall theme of the behaviors identified within that level of proficiency. A Behavioral Indicator is a task statement that demonstrates the use of a competency at a specific level of proficiency. Behavioural Indicators must be S.M.A.R.T. Singular: cover only one behavior. Measurable: can be objectively observed or measured. Achievable: can be accomplished by most employees capable of functioning at the fully effective level. Relevant: clearly related to the role/job/function and within scope of authority and authority of employees. Transparent: clear and understood by anyone who must use them. 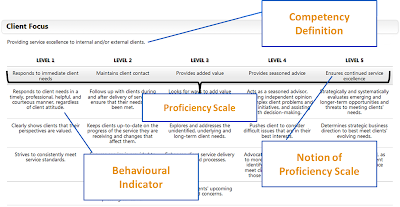 A competency profile or model is identifies the set of competencies required for a particular job or role as well as the levels of proficiency for each. Usually there are several competencies (5-10) for any given position. The starting point for any competency application is a competency model / profile that is valid and constructed in a way that it can be easily used to support all intended HR goals. With valid, fair and unbiased competency profiles, management can recruit, select, train, develop and reward employees in a manner that is consistent with the strategic vision and objectives of the organization. Therefore, any investment an organization makes in competency profile development has benefits far beyond the usefulness of the results for employee development purposes.